How do you like to play? On the handheld or online. 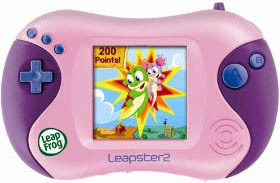 Leapster2 has forty learning games. This is a connected learning handheld that is both mobile and connected (kids connect online for extra activities and rewards). Games teach skills in a range of subjects, such as language arts, reading, mathematics and science.